A rotary stage is a component of a motion system used to restrict an object to a single axis of rotation. The terms rotary table or rotation stage are often used interchangeably with rotary stage. 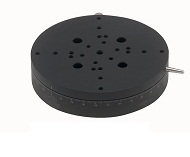 Manual rotary stage provides unlimited rotation with precise resolution. The stages are suitable for both horizontal and vertical rotational planes. This series of rotary stages provides precise manual rotational adjustment over 360°. The rotation stages provide precise and fine rotation for system assemblies. One can rotate the stages smoothly and continuously by hand through a full of 360°, when the steel locking thumbscrew is unlocked. We offer both “Economy Type” and “Precision Type” versions of rotary actuators.